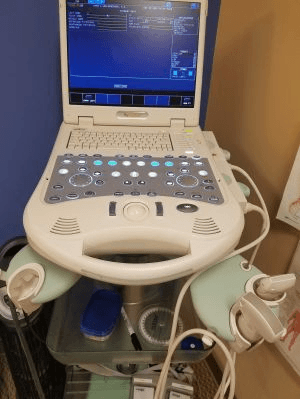 The used MyLab 25 Gold is Esaote’s premium Vascular portable ultrasound machine. In addition to advanced imaging technologies, the Esaote MyLab 25 Gold features Real-Time vascular imaging that is popular for “babyface” and diagnostic ultrasound. A refurbished MyLab 25 Gold features a 15″ high-resolution TFT, ergonomic user interface, and Esaote’s premium imaging technologies such as XView speckle reduction, Tissue Enhancement, and M-View Compound Imaging. The advanced package includes X4D real-time 4D technology. The MyLab 25Gold is able to perfectly match the latest technological innovations with ease of use and portability. This concept reflects and fully satisfies the recent evolution of user’s needs: high performance and reliability combined with compactness and portability. The system is sold by Admar Neuro Diagnostic Instruments, Inc. specializing in NeuroDiagnostic instrument resale and service.